This is the statement which greets you upon finding the Occupy London website (occupylsx.org). It’s certainly true that there have been occupation movements all over the world, with actions springing up in over a hundred cities in the USA, starting with the Occupy Wall Street movement, and in places throughout Europe (Frankfurt and Glasgow, to name but two). The general format has been the occupation of a public space followed by discussions, protests and joint actions. That the people taking part in the occupations have genuine concerns about the state of the world, the economy and political action is beyond dispute. A comrade of WR recently visited both occupied sites: “I visited Finsbury Square where I spoke to two young women, one unemployed and one working. One of them described their reasons for being there as being at some level unhappy with the current state of things.” The occupations provide something that is not in very great supply in Britain – a public space where people are free to come and discuss in general assemblies in an effort to try and understand the current situation of the world. The people at the occupations have come from different parts of the country, as well as from other countries. Some are actually working whilst taking part in the protest. There have been attempts to send delegates to, amongst other things, the current ongoing electricians’ protest. This at a time when, throughout the country as a whole, despite the widespread fear and anger engendered by the austerity being rained down, there has been little in the way of a genuine workers’ response. 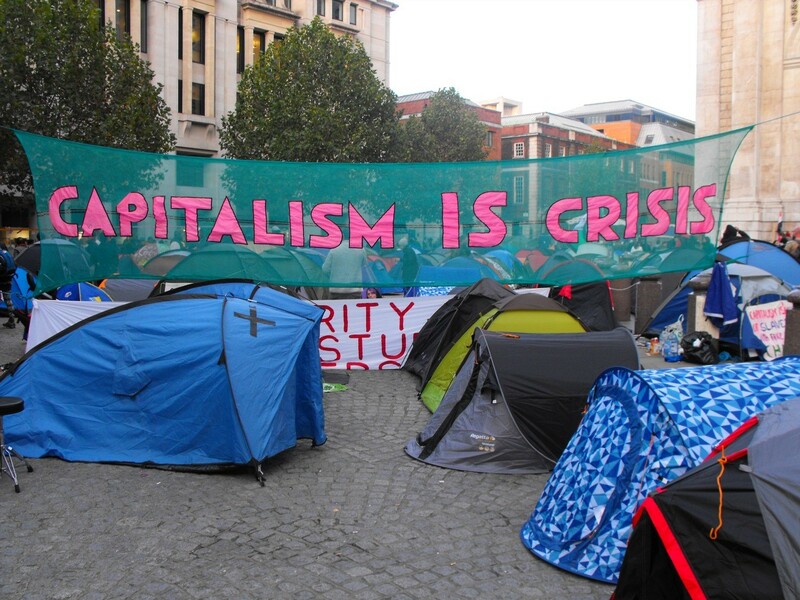 Occupy London is not only smaller than the movements in Spain and the USA that inspired it, but the voices raised in support of a working class perspective have been relatively weaker, and those defending parliamentary democracy relatively stronger. For instance the efforts to send ‘delegations’ to the electricians’ protests only a short walk away were seen as an entirely individual decision and initiative of those who participated, whereas in Oakland the Occupy Movement called for a general strike as well as evening meetings so that those who had to work could also participate (see http://www.occupyoakland.org/). This has left Occupy London very vulnerable to the manoeuvres around the threatened eviction – or the alternative offer of a reduced number of tents for two months – and the media circus around what is going on in the hierarchy of St Paul’s Cathedral with the resignations of first the Canon and then the Dean. The reaction of the mainstream media has been mostly predictable, from the ‘shock! horror!’ headlines to articles in the more liberal / left wing press arguing that these occupations represent a ‘boost’ or a ‘shaking up’ of a staid democratic system. All in all, most of the press, and the established church, have tried to find a way to argue that politicians should be ‘responding’ to the ‘concerns’ of legitimate protest. But in the absence of a perspective for going out to make contact with the wider working class this predictable media feeding frenzy, and how they present the occupation, has become a point of fixation. The threat of eviction, and how to defend against the violence and repression involved, is obviously an important concern. In many places across America, this ‘response’ by elected politicians has taken the form of heavy repression (witness the 700 protestors tricked and then arrested trying to safely cross Brooklyn Bridge, arrests and beatings at other occupations). However, when one of our comrades went to a general assembly at Finsbury Square that discussed how to react to the threatened eviction at St Pauls (before the offer to stay for 2 months and leave at an agreed date) the way the media would portray their response was the major concern. A proposal to go directly to workers, made by our comrade, like a reminder by another participant that their aims went beyond keeping the occupation going indefinitely, were not taken up. In fact both felt like distractions.